What happens when five musicians who can play anything put their heads together to play great music and new arrangements in styles as varied as baroque, big band, hard rock and French Impressionism? The answer is something very special and utterly unique. Stewart Copeland and Jon Kimura Parker are two artists used to breaking the mold. With three incredible collaborators, they have created a quintet that has one foot in the classical world and its other foot all over the place! As the iconic drummer of The Police, Stewart Copeland’s sound is immediately recognizable the world over. Jon Kimura “Jackie” Parker is a concert pianist whose forward-looking programming is matched by his incredible chops. In Off The Score Stewart and Jackie explore the intersection of the notes on the score that are ‘the bible’ in the classical world with the improvisational instincts of the rock and jazz musician. It is the rare classical musician that can improvise, as it is the rare rock musician who reads music. In these concerts, all of these musicians do both! Jackie and Stewart are joined by the brilliant violinist Yoon Kwon, whose day job is in the Metropolitan Opera Orchestra; the dynamic double bassist Marlon Martinez, a Stanley Clarke protégé; and Judd Miller, the extraordinary proponent of the EVI (Electronic Valve Instrument) who lends a gorgeous textural and orchestral element to Off The Score’s unique sound. 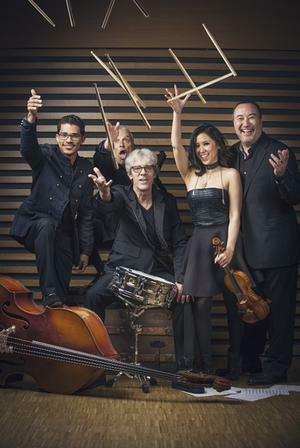 Both Jon Kimura Parker and Stewart Copeland are witty and articulate artists who are eager to share their fresh ideas as they move beyond the notes on the score and perform an evening of music for a new generation: propulsive and engaging, charismatic and fun.